Easy peasy lemon squeezie ! Short of time but want to make a pud for a Saturday supper or Sunday lunch? This can be quickly put together and left in the fridge until you are ready to serve. Brush a 23 cm (9 inch) springform tin with a little vegetable oil. Crush the biscuits in a large plastic bag with a rolling pin until fine crumbs. Heat the butter and syrup in a saucepan until the butter has just melted. Take off the heat and stir in the biscuits until coated in the butter then tip into the tin and press into an even layer over the base. Whip the cream in a large bowl until it forms soft swirls. Gradually whisk in the condensed milk, add the lemon rind then gradually whisk in the lemon juice until the mixture is smooth and thick. Pour into the tin, spread into any even layer then chill for 3-4 hours. 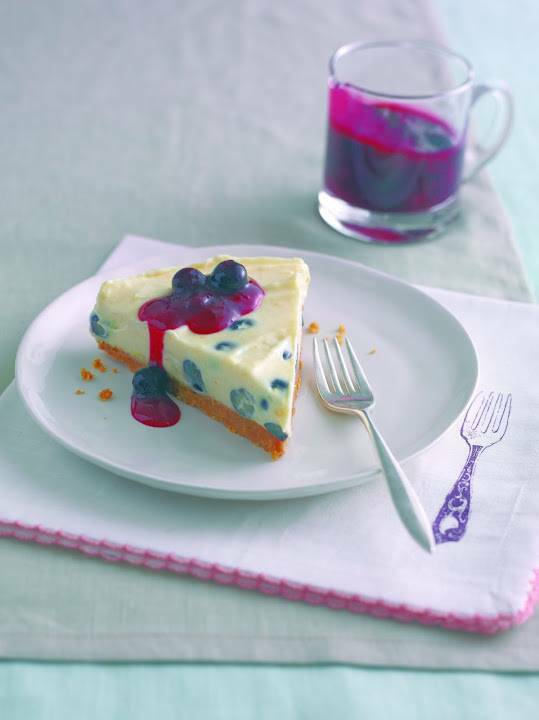 To make the sauce mix the cornflour and water together in the base of a small saucepan, add the sugar and blueberries and cook for 4-5 minutes over a gentle heat, stirring until the juices run from the blueberries and the sauce thickens. "Chocolate berry pancakes with minted yogurt…"
That looks so delish. Yummo! This looks so delicious Clairejustine! I have not yet had breakfast here in Jamaica and now I am feeling so hungry! :) Have a great Sunday! Very pretty dessert! Lemon and blueberry sound like a great combination too. This looks so refreshing and spring like. Thanksnfornsharing at MustbTry Monday. Oh how yummy that looks! Thanks for linking up to A Pinteresting Party!